The “figure” you see here has assumed a few roles within its existence. Firstly, as you can see from the metal chain on the head, it was originally an accessory which came attached to a handbag, but upon realising that it wasn’t suitable for more sombre occasions like job interviews for example, I detached it and let it become a cute ornamental addition to the coffee table. Then, over time, it came to be a convenient symbol, and even a by-line, for other things too. Namely, being a handy “pointer” towards things on that coffee table which needed to be done and still hadn’t been done and could they be done soon please… During this time it came to be known “affectionately” as Passive-Aggressive Monkey. Strange memories of employing the monkey for various tasks which were as-yet-incomplete were formed during this time. Later on, when my general life situation become more “on track”, such as in beginning my postgraduate course, it would be relegated to being merely a faded relic of a time gone by, a creature sadly out of a job and unnecessarily reminding me to get things done, as I would glance at it, safe in the knowledge that no I no longer needed reminding to get things done, and could it simply sit there and enjoy its retirement in peace. However, as the course proper is now finished and, yes, I technically have a qualification, there is still the tricky matter of the Dissertation. Capitalising the “d” is deliberate, due to its current omnipresence in my life. Not only is this the second dissertation I’ve had to do, it’s exactly twice as hard, if not more so, than my first dissertation, not least due to being twice as long and to be completed in less than half the time. Without boring you with the details of exactly what I have to research and write, you can take my word for it that it is a capital-c Challenge. Erstwhile – as I alternate between a genuine desire and interest in the subject and try to learn as much as I can, then feeling the motivation drain away like someone’s pulled a plug somewhere inside me, replaced with a genuine conviction that I’ve indeed bitten off more than I can chew and the pesky thoughts creeping in that I should quit while I’m ahead and bow out with at least a shred of dignity before I spectacularly crash and burn – the Monkey has been sitting quietly assuming a new, but not entirely different, role on the coffee table and in my life. 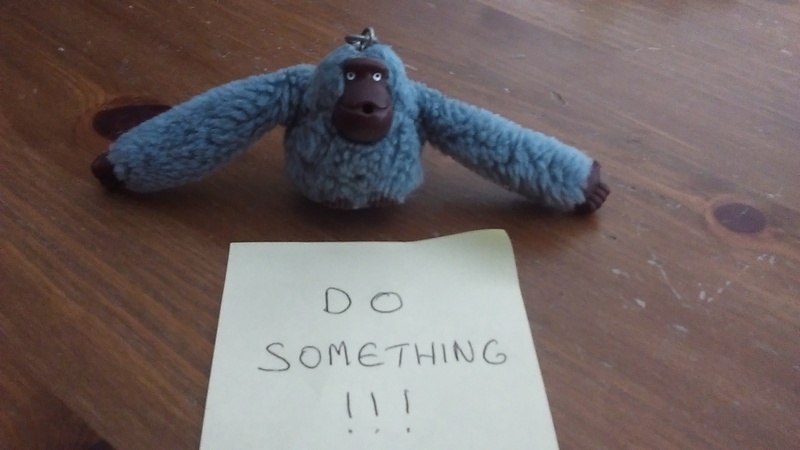 Now it has become Procrastination Monkey. Pure and simple, Procrastination Monkey simply epitomises the fact that, with the relatively few distractions I have to doing my dissertation and it being the only “real thing” I have to do right now, I currently have no excuse or rationalisation for my hardly having written a thing even halfway into the dissertation “season”, nothing I can point at and say “that’s the reason” – only me. The fact that almost any significant task, which involves time and patience, and significant re-writing which leaves my brain in a useless tangled pile, has now been short-cutting me straight to the “I can’t do this so why bother” stage. The voice of conscience maybe, like Jiminy Cricket in Pinocchio, but ultimately silent, and judging, not even able to give any advice or assurance or motivation. Something like “OK honestly if you just push through this feeling of drainage and demotivation and just Do It Anyway you’ll at least get somewhere even if it takes you an embarrassingly long time” would be something, but that would also be expecting slightly too much from what is ultimately an inanimate object on the coffee table. Just that it would be a positive nudge if it could give silent admonition, but also a nudge forward in the right direction. Until then, it will just have to sit, assuming any role I give it, so anthropomorphically of me, while it sits on the coffee table, occasionally obscured by a mug of coffee.